The event will be held on Thursday January 30, 2014 at 5:30pm at Noto’s Old World Dining. 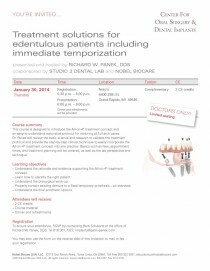 It is a complimentary course with 2 CE credits. This event is limited to Doctors only. 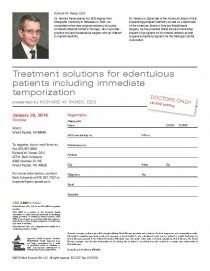 Please call Becky Weidenfeller @ Studio 2 Dental (616) 957-2140 or Barb Schwartz @ (616)361-7327 to register.